Science means something very special to me. It is the key to our existence in this sliver of the cosmic timescale. When I need to get the world and its many intricacies (and frustrations) in perspective, I think of Carl Sagan’s immortal words about the “pale blue dot.” I have included his words estimating Humankind’s “true circumstances and condition” below in their entirety. The words are important and I can’t underestimate the power of these ideas. They’ve provided me solace on many occasions. It was Sagan’s idea to turn Voyager I’s camera back toward Earth as it sped out beyond our solar system. In this immense sea of darkness, the stark vacuum of space, a dim pale blue dot is seen. The picture was taken on February 14, 1990 from a distance of 6.4 billion kilometers (see attached image). Seeing our world from that perspective allows me to better understand the miniscule significance of my problems and the problems of our Earth. I feel strong and rejuvenated after looking at the blue dot, and it makes me think about how science is our best tool for allowing us to embrace the complexities of the future. I can think of no better way to embrace our world the way it truly is than to revisit Sagan’s words in moments of weakness, insecurity or self-reflection. I save it for special times, tears welling up inside me as I read the words, ponder existence, and seek a more reasoned future. “Look again at that dot. That's here. That's home. That's us. On it everyone you love, everyone you know, everyone you ever heard of, every human being who ever was, lived out their lives. The aggregate of our joy and suffering, thousands of confident religions, ideologies, and economic doctrines, every hunter and forager, every hero and coward, every creator and destroyer of civilization, every king and peasant, every young couple in love, every mother and father, hopeful child, inventor and explorer, every teacher of morals, every corrupt politician, every "superstar," every "supreme leader," every saint and sinner in the history of our species lived there – on a mote of dust suspended in a sunbeam. Although Ptolemy thought the Sun revolved around the Earth, he also concluded that the Earth should be treated as a mathematical point in the universe. Now, since a mathematical point is infinitely smaller than a "pale blue dot," do we conclude that Ptolemy must be humbler and wiser than modern astronomers? Well, maybe I'm being nasty and objective, when I should be misty-eyed and subjective. I might be a candidate for sensitivity training. Unlike "pale-blue-dot" astronomers, I don't try to feel the pain of the robbed (nor do I try to feel the pleasure of the robbers). To pretend to know the pain of others is to belittle the pain of others. From a comfortable armchair or a speaker's podium, all human trials (pains, pleasures, joys, loves, etc.) 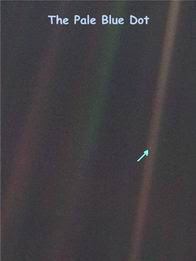 can only be reduced to a "pale blue dot" by exceptional Pride - not by insightful thinking. Trying to synthesize people with their planet is called Pantheism - not Astronomy. nor anything taken from it..."